Some names have been changed to protect anonymity. The new, white, all-leather-interior, French-made Peugeot hatchback I’m riding in is one of the many cars zooming along Sari’s Shoonesh on a hot and humid April evening in 2010. Sari, a few hours north of Iran’s capital, Tehran, is a small city with a population of 200,000. If you’re young, privileged, and bored in Sari, Shoonesh is the place to be on a Friday night. Racing through the narrow streets, you need only a passing glance of consent from a neighboring driver to signal that they’re down for a challenge. Within minutes a black BMW X5 cuts off the Peugeot. It’s the perfect partner for the group I’m with this evening. A moment later an orange Peykan—a common, locally manufactured car that hasn’t had an update since the 1960's—honks at us. “Ah-hh [the Persian equivalent of eww], he’s straight out of the da-hat [ghetto]. 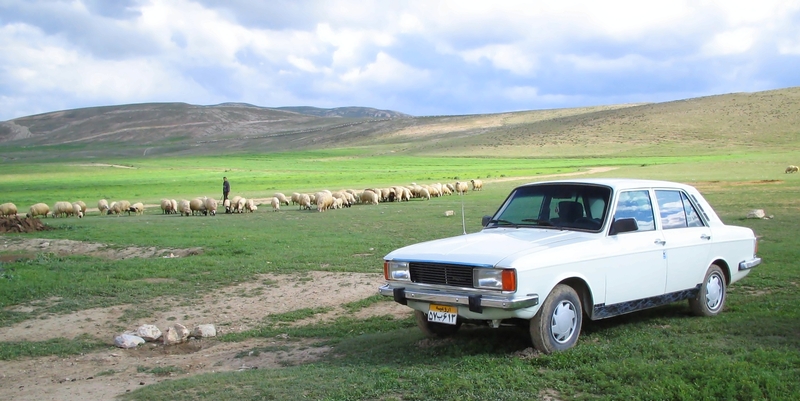 He’s borrowed his uncle’s car.” Sima quickly cuts off the Peykan and we lose sight of him. Sima is a second-year architecture major at Daneshga-eh Noor, a university one hour north of Tehran. A daughter of one of my uncle’s co-workers, I had met her the night before at a party held by one of my uncle’s friends. “If there’s an enghelab [revolution] tomorrow, believe me, we would be the next Europe,” Sima tells me, in a conversation not about politics, but shopping. Her Marc Jacobs dress and black Christian Louboutin pumps help her argument. Sima has a frank and free attitude toward life that detaches from most Western, media-oriented perspectives of Iran. There was a long list of issues brewing in Iran during the spring of 2010: a boorish President, a budding nuclear program, human rights violations, continual unrest after a corrupt 2009 presidential election, and ongoing international sanctions. Yet for a 20-year-old upper middle-class girl like Sima, her concerns don’t involve politics: western headlines don’t define her Iran. The city of Sari is where I spent much of my trip. 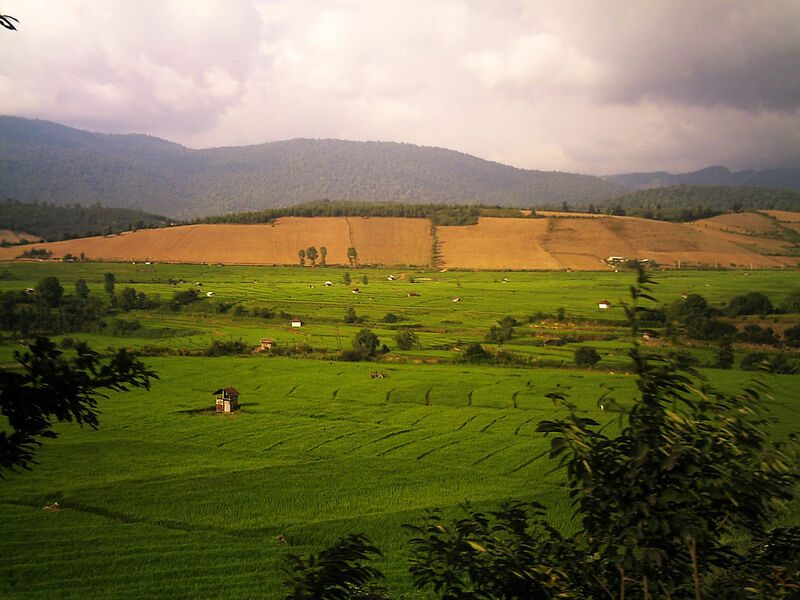 It’s a small rural city in the northern Iranian province of Mazandaran, where my mother’s family lives. Sari is known for a lot of things: scenic mountain ranges, some of Iran’s most fertile shalizars (rice fields), and probably the biggest pool of hospitals and medical doctors in the entire country. Rice fields (shalizar) in Iran. Image by Juybari (CC BY-SA 3.0). My dayee (uncle) Farhad is a pharmacist and medical supplier for Beemarestaneh Shafa [Shafa Hospital], with supply links to the 10 other hospitals located in Sari. His vast network of business and social ties worked to my advantage by providing me with an invitation to a party attended only by Sari’s medical practitioners. This is where I would meet Sima. Almost every specialist and surgeon who was not on call in Sari that night was at that party. My immediate impression of the luxurious marble-floored apartment, where the soirée was held, was of an image out of The Stepford Wives . The women and men were segregated. The men huddled around the bar where the male host urged his guests to drink. In another room, elegantly poised and groomed ladies sat socialising on big French antiques. I felt a little disappointed when the host sat me in the French antique room. The corner with the alcohol looked like it would lead to a much better night. Once I met Sima things started to turn around. I got a quick explanation of who all the guests were. It turned out the party was no ordinary gathering, and the stylish women were more than pretty powdered faces. There were a variety of dentists, family doctors, and plastic surgeons among the guests. The most impressive of all was Sepideh, dressed head-to-toe in black, in typical Persian fashion. At 35 years of age, Sepideh is the head of the Department of Gynaecology at Imam Khomeini Hospital, Sari’s largest, and one of the most prestigious medical centers outside of Tehran. Something along the lines of Johns Hopkins, Imam Khomeini is the training ground for the country’s best medical students. Sepideh is the youngest doctor to attain such a position. She’s also happily married with two young daughters. Naturally, this woman who seems to have it all intrigues me. Not bad in a country that has a codified law that views the worth of women to be exactly half of that of men. Under Iran’s strict gender policies, the fields open to female doctors are quite limited. There is no conscious effort by the Iranian regime to promote professional female doctors. Since the 1979 Islamic revolution, a quota of only about one-third of all medical students in Iran’s medical schools are allocated to women. The party ended up exceeding my expectations, especially after I discovered huddling around the bar was unnecessary—the alcohol was served to the ladies on silver trays. However, this was only a glimpse at how a small group of Iranians live. The vodka-cranberries served to me as I marvelled at the successful and beautifully groomed ladies around me, were only part of my enlightenment process. While I read and listened to music on a swing chair in my grandparents’ house that spring, Olliyah, the 20-year-old housekeeper my grandparents had hired sometimes joined me in her spare time. Help around the house is typical for most Iranians among Iran’s middle class. Needless to say, the Iran Olliyah inhabited is a completely different country than Sima and Sepideh's. Our conversations over a bowl of zeyton parvardeh (tiny Iranian olives) on the porch were the only instances where I saw Olliyah without her headscarf. She tells me it’s inappropriate to walk around my grandparents’ home without her hijab when a man she isn’t married to is present. Without the headscarf she was barely recognizable to me. She resembled Sima and the female doctors in terms of Persian beauty, but Olliyah’s style was of a different nature. Her uniform around the house was a long bronze silk skirt, a long-sleeved cotton blouse, and a synthetic purple scarf with black beads stitched all over. She sewed her skirt herself and bought her scarf for 1,000 toman (CAD $1). Our first conversation revolves around how it feels to be 20 years old. I told her about university and my plans for grad school. She tells me about her husband and her plans to sign up her three-year-old daughter for day care in their deh [village], 40 minutes away. It wouldn’t seem like we would have much in common, but we managed to find common ground discussing clothes and opinions of President Ahmadinejad. She confessed that she did’t know how to read or write. Her 11-year-old brother died in a highway collision riding on the back of a motorbike when she was 14, and she never recovered from the trauma of losing him. She quit school and stayed at home to help her grieving mother take care of her younger brothers and sisters. At 17 she was married off to her husband, Shahban, who was 27. For cleaning my grandparents’ house, she and her husband get free room, board, and food. She told me she was saving her money to buy her daughter a new dress for her mother-in-law's next party. A dominant headline from Western newspapers that summer was about Sakineh Mohammadi Ashtiani, an Iranian widow from the Northwest province of Azerbaijan who was sentenced to death by stoning for committing adultery with the man who murdered her husband, after the murderer walked free. Cases like this expose the tragic circumstances for women and justice in Iran. But for others like Sima, Sepideh, and Olliyah, life goes on in much the same way it does in the rest of the world. There was nothing overtly political about these women’s lives when I encountered them in 2010. The prospect of new sanctions imposed on their country didn’t seem an immediate concern. In 2010, discussions about Iran often centred on the fact that the country had one of the world’s most active civil societies and usually referenced the Green Movement that evolved in 2009 to protest the rigged re-election of President Ahmadinejad. I spent a few weeks in Tehran during the summer of 2009, and was very much enraptured by the arrests, activists and green wristbands, and the fervor of the aftermath of the movement that surrounded me in the capital. None of the three women I met in Sari in the summer of 2010, who left such a strong impression on me, had any particular attachment to those protests. Sepideh was a doctor at a state-owned hospital—any overtly political stance would compromise her job. When I asked Sima about the protests, she said it was great fun and that she was a supporter of Mir-Hossein Mousavi, Ahmadinejad’s political adversary. The way she talked about taking to the streets of Sari, it seemed like she protested more as a pastime than a political statement. She had little to say about the policies of the candidates. The death of one protester, Neda Agha-Soltan, captured on video and posted on YouTube, was a violent image of the state's repression of protests. How could we not rally behind the cause of the Green Movement? Olliyah didn't care much for these images. She did not watch the news footage of Neda on repeat on CNN in June 2009; those ideals of reform and rights fought for by the green activists had little meaning for her. Providing for their families’ day-to-day needs was her main concern. I felt a little taken aback. Was it really that hard to see the situation from a different perspective? I mean, I stand for human rights, and fair elections, and I have no particular affinity for an Islamic state (and by no means Ahmadinejad). I considered myself “Green” in 2009, but I have no definitive answer about Iran’s political future, and hardly think I can speak for that future given that I don’t currently live there. But is it possible to dream of an Iran where no election fraud occurs? Where Olliyah’s family is provided for? Where Tehran could be considered as fashionable as any other European city by someone like Sima (and maybe it has a little bit now in 2015)? Where gender and politics never jeopardized Sepideh’s medical career? It's now the 36th anniversary of the Islamic Revolution in Iran, and these questions from five years ago still fill my head as I reflect on the last time I was in Iran.